But is it Japanese knotweed…? With more and more horror stories rising to the surface about Japanese knotweed and its trail of destruction and costly consequences, it’s important to know that there are other less harmful plants that are commonly mistaken for the treacherous knotweed. Japanese knotweed is not always easy to identify. 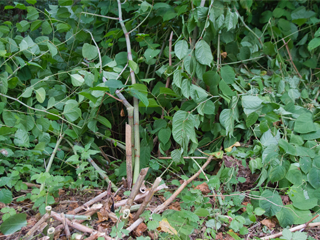 The best time to identify Japanese knotweed is during mid-summer and autumn; during spring the reddish/purple shoots will sprout from the ground, growing up to 2cm a day – developing into dense bamboo-like stems with green heart-shaped leaves. The plant’s rhizomes/roots spread mainly underground, flowering late summer, lying dormant (but alive) during the winter months, ready to emerge the following spring. Knotweed stems are not woody, so anything with stems that resemble twigs that snap or can be stripped is unlikely to be knotweed. Knotweed can also stand on its own, whereas some of the copycats tend to be weaker in stature.Japanese knotweed is not always easy to identify. The best time to identify Japanese knotweed is during mid-summer and autumn; during spring the reddish/purple shoots will sprout from the ground, growing up to 2cm a day – developing into dense bamboo-like stems with green heart-shaped leaves. The plant’s rhizomes/roots spread mainly underground, flowering late summer, lying dormant (but alive) during the winter months, ready to emerge the following spring. So what are the other plants that are mistaken for Japanese knotweed? Here we list some of the more common ones. Dogwood can generally be found in wooded areas and hedgerows. Like Japanese knotweed dogwood was introduced as an ornamental plant, and the resemblance to knotweed is largely due to leaf appearance – spade/heart-shaped leaves. However, dogwood leaves grow opposite each other along their woody stems. With similar heart-shaped leaves to knotweed, bindweed also has an aggressive and speedy growth pattern, covering large areas of space in a short amount of time. However, whereas Japanese knotweed will grow over the top of other plants, bindweed will entwine itself to surrounding plants. Biologically, Russian Vine is closest in relation to Japanese knotweed, sharing the same genus, leaf-shape and fast growth rate. However, it grows similarly to bindweed, twisting itself around nearby plants or structures and is often used as a screening plant for fences. The Bamboo stems resemble knotweed stems with clear nodes and can grow as tall as knotweed, if not taller. Bamboo can also be very invasive and, as the fastest growing plants in the world (source: Guinness World Records), spread quickly to unwanted areas becoming quite difficult to effectively treat with herbicides. However, where knotweed stems can snap easily, bamboo stems are very hard. The long and slender bamboo leaves are also completely different in appearance to knotweed. See our invasive plant species survey works, treatment plants and removal validation services.